Food projects and greenspace initiatives from Adur and Worthing were showcased at the annual GreenDreams festival. Having promised to be bigger and better for its third year, the festival did not disappoint, with more community groups involved, more workshops and around 2,500 visitors to Field Place in Worthing for the occasion. 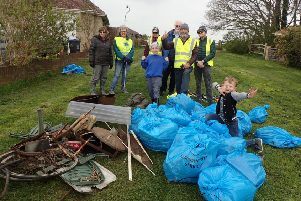 Organisers from South Downs Leisure said they were lucky to be supported by the Rampion Fund this year, which meant they could bring a wide variety of community and social enterprise groups to the festival. Anne Thwaites, founder of We are Food Pioneers, said: “As a stallholder, it was an absolute joy chatting with visitors, staff and fellow stallholders, making so many new and very meaningful connections for future project collaborations. “Looking at all the events we’ve been to, GreenDreams really is a stand out festival that is nothing but genuine and perfectly showcases the wealth of diverse groups and activities we have in our town and the local area. Graeme Brooker, trainer at The Conservation Volunteers, hosted some fascinating talks on British trees and folklore surrounding them, and a foraging masterclass was hosted by Forest School leader Fern Freud, an expert on the subject. There were also taster sessions of exercise classes like tai chi, pilates, yoga and meditation, hosted by FIT4 instructors from South Downs Leisure. Entertainment included Broadwater Community Choir, who opened the event, plus The Logical Hairs comedy band, clarinet quintet Chalumeaux Too, Nefertiri Dance, Keenes Dance Studio and Northbrook College duo Across the Sea. Paul Sandell, business development officer, said: “Once again, the day was a brilliant opportunity to find out about different things going on in our local community and to encourage the public to get involved with lots of different local groups. “Being lucky with the weather this year ensured the crowds turned up in their numbers to make the most of the occasion and the stunning venue, which made for a fantastic atmosphere and gave a great feel to the festival.